Since launching FoodHack, our community of food and food tech entrepreneurs 3 years ago, we’ve seen food trends come and go and ideas start and fail, but one thing that’s stayed constant is the number of new entrepreneurs starting their own food startups. Consumers like you and I are becoming more aware of the way we eat and the impact it has on ourselves and our environment. Climate strikes from young people across the world are putting pressure on governments and organizations to revisit their priorities and activities. The way we eat plays a large part in the discussion. All of this is giving fertile ground for new and alternative startups to pop up and better serve the consumers changing values and beliefs. More relaxed cannabis laws open the way to new hemp based products, conscious consumers lead the way to plant based meats, there are groceries cutting out plastic, restaurants offering only hyper local menus, apps helping you reduce your waste and even brands feeding your pets vegan food. Where there’s a demand there’s a solution and entrepreneurs are popping up from all walks of life cashing in by feeding our changing diets. What startups may lack in capital, resources and manufacturing power, they make up in agility, flexibility and the ability to capitalise on trends that corporates may deem too small or unworthy. They scrape out a market for themselves, feed a growing demand and build a loyal customer base. Incubators, accelerators, programmes, trainings, whatever you choose to call them, they’re popping up like wildfire. From corporate backed accelerators like Masschallenge and Kickstart Accelerator, to university run programmes like the Food Innovation summer school and everything in-between, there’s are an abundance of programmes out there tailored to support the needs of growing successful food startups. Coaches, mentors, advisors, investors are getting involved with startups and it seems everyone is catching onto the opportunity that food startups present and are trying to get their slice of the pie. On a global scale, WeWork just announced their plans to open their first WeWork Food Labs dedicated to growing food startups; EIT Food has amassed over 50 partners worldwide in just under 2 years to better support disruptive food startups; universities and schools are launching degrees tailored to the teaching the future food experts of the coming generations. Whatever age or stage of career you may currently be in, there is most likely a support programme out there waiting for you to apply. So go on and seize the opportunities. 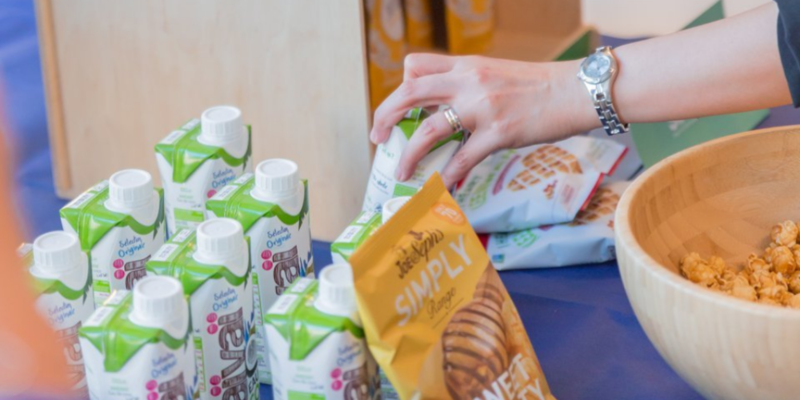 Last year Nestlé announced they’d be cutting up to 500 jobs in Switzerland, last month CPW announced they’d be closing their facility and cutting a further 80 jobs. These headline although present both a problem and an opportunity. In the following years as big corporates continue to cut jobs, they’ll be an increased number of experienced talent available and ready to put their skills to good use for disruptive startups. Everything from food law, food financing, food safety manufacturing, marketing and more, are becoming available and able to hire as employees, mentors or advisors. Intrapreneurship, great to imagine, difficult to put into place. More often than not I’ve found that a large number of current and ex-corporate employees are frustrated with their jobs, feel like their ideas go unheard or lack a sense of fulfilment in their careers. This leads them to leave or dream of leaving their jobs to then go on and start their own business with a wealth of experience and industry contacts behind them. This is not a new cycle but it does present an opportunity for corporates to better engage their employees and incorporate startup methodologies, undeniably not an easy task but not an impossible one too. We’re seeing more innovation teams across companies like HACO, Nestle and more, and so if you’re working a large company and have a great idea, it’s worth exploring the possibility of launching this internally with your innovation team, before handing in your notice. Stay up to date with the latest news on the food startup scene. So, what is still lacking? A key problem faced by foodpreneurs with edible products is the lack of access to an equipped and licensed facility where they can scale up their food productions. This presents a massive barrier to growth and one that our team and other similar projects across the globe are looking to tackle. Be that through sales, family, friends, funds or whatever means, capital fuels growth. New staff, equipment, branding and marketing all of this costs money and it can often be difficult for startups to access the necessary capital they need to scale up. Dedicated F&B funds are starting to crop up but we still have a long way to go. I spoke above about the abundance of support that exists but the way that these are set up mean that the support is often fragmented across the country. Startups jump from programme to programme which often slows their growth along the way. Instead we need to build a space where programmes, events, experts, partners, customers and access the tools startups need exist in one place in an effort to help grow successful food startup all under one roof. Growing a food startup is a challenge, one that requires long hours, full of it’s unique set of problems and one that typically has high upfront costs. If you are considering starting your own food startup, treat it like any new business, thoroughly understand your market and your customers, take measures to test your interest and feasibility and make a realistic plan and budget ahead. Maybe you’ll find launching your own startup isn’t the way to get started, instead try applying existing food startup jobs or getting involved as a mentor, at the very least attending some events around food entrepreneurship or joining an existing network to get to know the scene better. Organizations like FoodHack are around to help make your transition or progression as a food startup easier by linking you with like-minded entrepreneurs, cross-sector partners and in the future providing you with access to food grade production sites and dedicated funding. If you’re serious about starting a career in a food startup in Switzerland, get in contact with our team or find a local network in your area. Arman is the co-founder and CEO at FoodHack. Since 2016 Arman has worked to understand the needs and challenges of different actors across the food ecosystem and his organization exists to help grow future foodpreneurs and startups. Prior to FoodHack, Arman worked as a marketing and strategy consultant helping brands tell better stories and facilitating collaborations between the startup and corporate world.